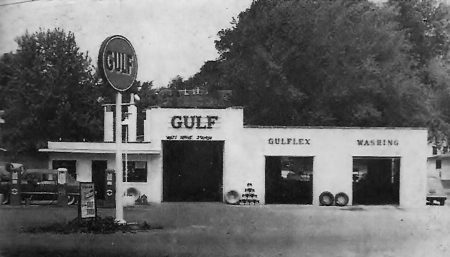 The gulf station was a full service station that even had a car wash. It was run by a number of local folks over the years including Walt DeVolder , Ralph Hood, Bob Jones and Barbara Jean (not the furniture lady). 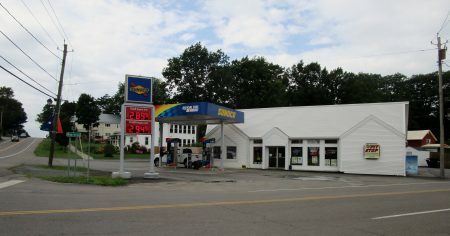 Engle & Lanlare (from Wolcott) owned it and they were the ones that updated it , they put new gas tanks above ground behind the station. Fire Chief at the time (Pete Knapp) had concerns about it being a fire hazzard and they ended up burying them. It would later become a car wash then a laundromat and eventually it would become the Pit Stop that we know today. 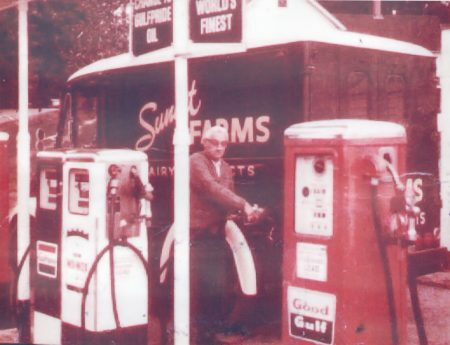 Bob Jone’s father (Tal Jones) pumping gas circa 1962. Gas prices were approx. 30 cents a gallon. Photo courtesy of Bob Jones.